Homelessguy on When in doubt, sneks. Devoted Druid + Quillspike makes you an army! Carmasem Yeah you're right! I cutted the Infect Stuff besides Flesh-Eater Imp and Glistening Oil. 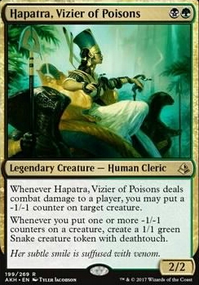 The Imp alone is to heavy imo and Glistening Oil could help me start my combos.I added some Ramp Cards and thought about Harvest Season, seems good in a Token Deck but prbly to "late"
Yay i am so happy to see another person biulding hapatra in this format! I must say though, i'm not sure that the +1+1 counter are going to do enough for you in this deck. I would personally take out the Blood Artist and Zulaport Cutthroat as well and put in the Devoted Druid + Quillspike infinite combo. Throne of the God-Pharaoh has won me so many games you totally have to find a way to get that card in there. [GS10]Understandable. My meta is very competitive and no deck shys from of combo. 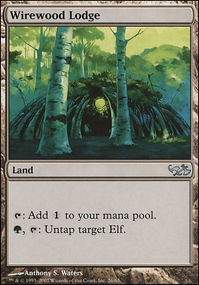 A deck should be built on your meta and what you enjoy.I love cEDH for the interaction. 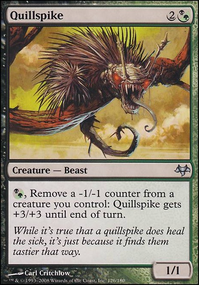 Butcher is a good hit for Buried Alive but so is Devoted Druid + Quillspike then throw in Jarad, Golgari Lich Lord + Necrotic Ooze on the battlefield. Lovely combo I enjoy and I understand you're not into combo but test it out. [bushido_man96] combo is Jarad, Golgari Lich Lord + Necrotic Ooze with Devoted Druid + Quillspike in the graveyard. Oh by Steve I mean Sakura. Sakura is for sure much better than Devoted Druid but have Devoted Druid + Quillspike as another win-con is great. 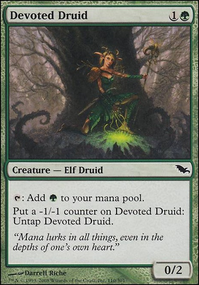 Devoted Druid + Hapatra, Vizier of Poisons + Ivy Lane Denizen generates infinite green mana and infinite snakes. 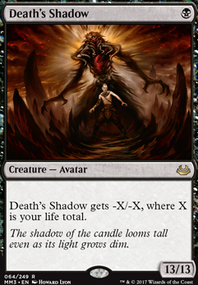 It's also a token deck so Eldrazi Monument or Triumph of the Hordes as can work as wincons! 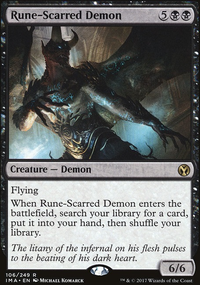 Yeah I would like to add a mikaeus but im reluctant as I have a mikaeus edh, yet I don't want to take it out of there or buy another one. And actually from some playtesting using Crumbling Ashes i've noticed that it actually doesn't do too much work generally as it's only one kill per on my upkeep nonetheless, it can work definetely and i'll give it some more playtesting! Thanks a ton!